Highly branched cyclic dextrin (HBCD) is a novel type of maltodextrin with a narrow molecular weight distribution that is produced from starch. In this study, we investigated the effects of HBCD administration on endurance performance. Seven elite swimmers participated in three trials, conducted in random order. 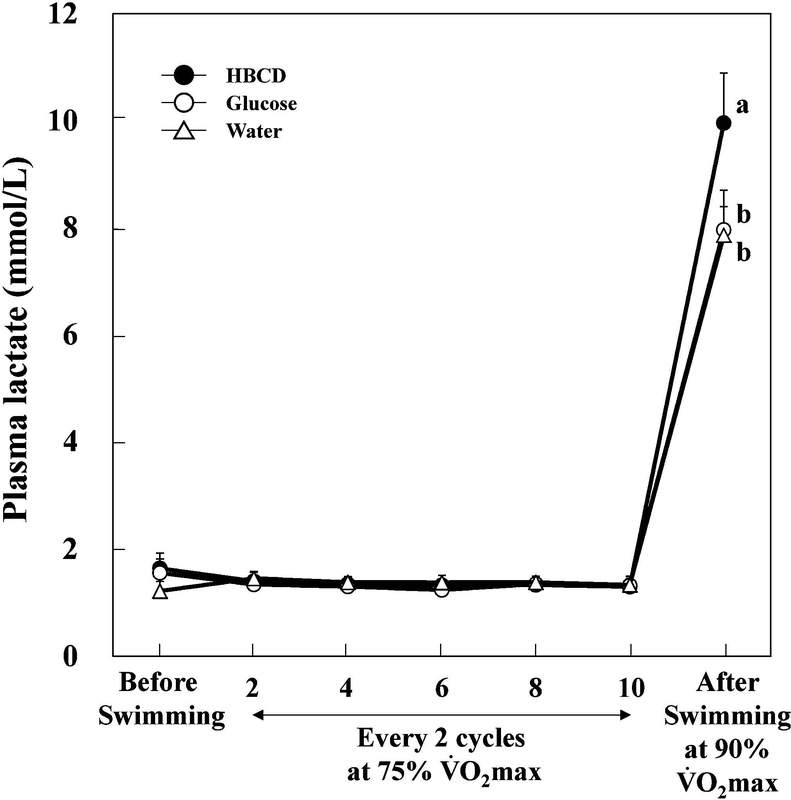 In each trial, the subjects received either HBCD, glucose (1.5 g carbohydrate/kg body weight) or water (as a control), and immediately carried out 10 cycles of intermittent swimming consisting of 5 min of swimming at 75% followed by 3 min of rest, and subsequent swimming at 90% to exhaustion. The time to fatigue was about 70% longer in the HBCD trial than that in the glucose and control trials, a significant difference. 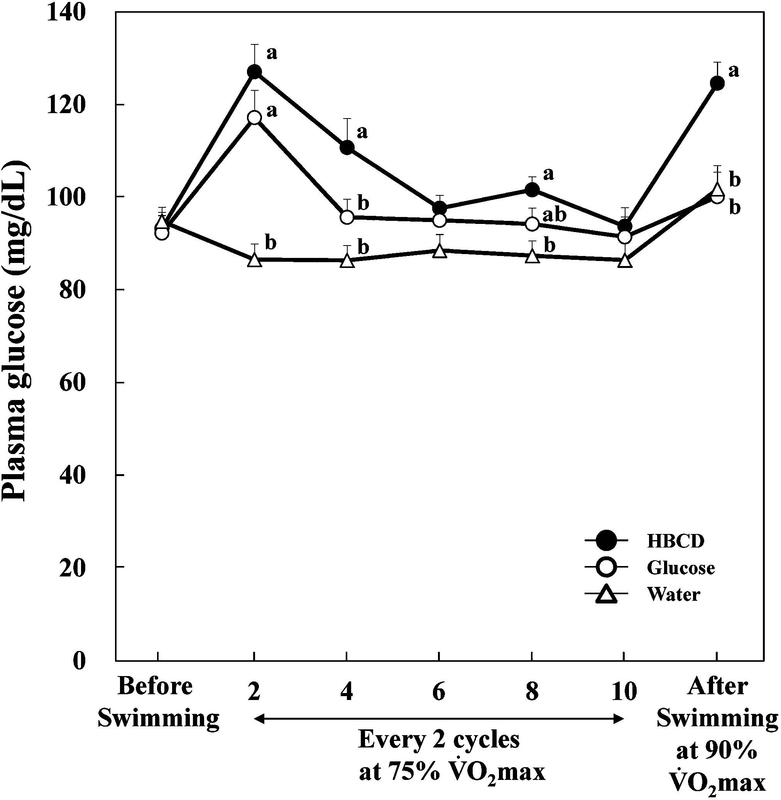 Plasma glucose in the HBCD group was maintained at higher levels during pre-swimming cycles than that in the glucose or water group. These results suggest that HBCD administration enhances endurance performance. It is widely known that the ingestion of carbohydrates (CHO) before, during, and after exercise can effectively improve performance (Coyle, 1992). One mechanism for the effect of CHO is considered to be its contribution to maintaining high blood glucose concentrations. The International Society of Sports Nutrition has set the recommended amount of CHO ingested as 1 – 2 g/kg body weight (bw) 3 – 4 h prior to exercise, and 30 – 60 g/kg bw per hour during exercise (Kerksick et al., 2008). Various types of compounds have been examined as CHO sources for exercise. For example, the effects of glucose, fructose, sucrose, maltodextrin, and mixtures of these substances on performance have been investigated and are reviewed in Coombes and Hamilton (2000). Of these, maltodextrin is a potential CHO source in sports drinks since it has relatively low sweetness and osmotic pressure. Maltodextrin is a partially degraded starch, and various types of maltodextrins that have diverse molecular weights are commercially available. Maltodextrins are composed of a broad range of molecules with various degrees of polymerization, since α-amylase used for its production randomly breaks down the linkages in starch molecules. HBCD (highly branched cyclic dextrin) is a novel type of maltodextrin produced from waxy corn starch by the cyclization reaction of branching enzyme (EC 2.4.1.18) (Choi et al., 2009; Takata et al., 2003; Takata et al., 1996). The weight-average molecular weight (Mw) of HBCD is around 400,000, its polydispersity (Mw/Mn (number-average molecular weight)) is less than 2, and its dextrose equivalent (DE) is less than 5. HBCD has a relatively high molecular weight and narrower molecular weight distribution than other conventional maltodextrins. Because of its controlled structure, we proposed that the effect of glucose polymers on exercise could be reliably examined using HBCD. Additionally, HBCD is highly soluble and stable in water, does not have an unfavorable smell or taste in solution, and has low osmotic pressure. Osmotic pressure is an important factor that determines the gastric emptying rate (GER) of a drink. Using ultrasonication, Takii et al. (2004, 2005) demonstrated that an HBCD-based drink had a higher GER than glucose- and maltodextrin-based drinks at rest and during exercise. 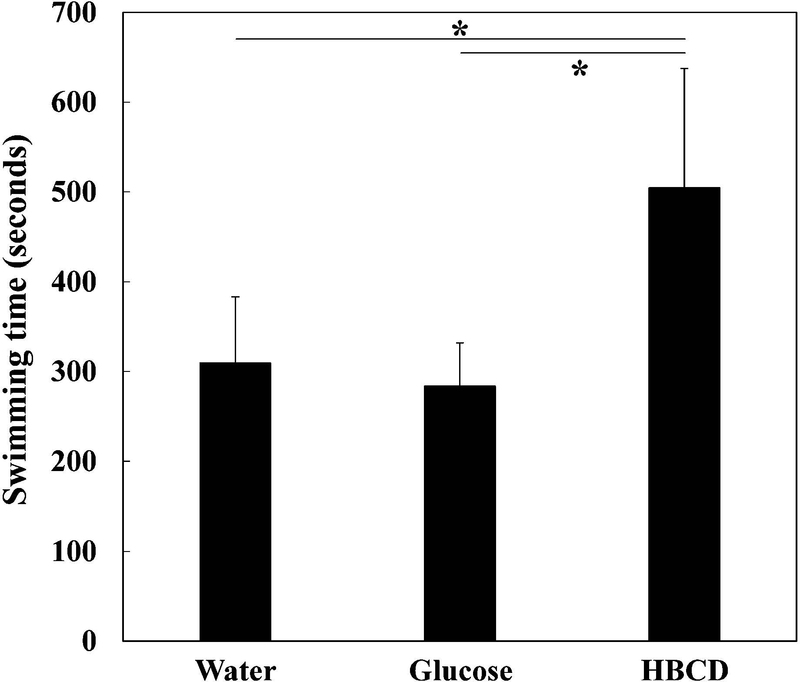 Subjects reported less discomfort during exercise when they received an HBCD-based drink compared to a glucose- or maltodextrin-based drink (Takii et al., 2004). Notably, HBCD administration in mice was observed to enhance endurance exercise performance (Ishihara et al., 2009; Takii et al., 1999), and administration of 15 g HBCD in humans resulted in a lower rating of perceived exertion during endurance exercise (Furuyashiki et al., 2014). The aim of this paper is to examine the effect of HBCD intake on exercise performance in athletes. Subjects Seven male elite swimmers (age 20.0 ± 1.3 yrs., height 175.4 ± 8.9 cm, body mass 72.2 ± 5.4 kg (mean ± SD)) volunteered to participate in the study. The average was 60.7 ± 4.2 (mL/kg/min), which was determined in advance by the constant load method during swimming in the swimming flume (Fernandes et al., 2003; Nomura et al., 1981). The subjects had participated in the Japanese (national) championships in the year prior to the experiment and were training six days per week. All subjects completed a medical questionnaire and provided written informed consent prior to the study. The experimental procedure was approved by the Institutional Ethics Committee of the University of Tsukuba, Graduate School of Comprehensive Human Sciences. Research design All of the subjects consumed an identical meal between 20:00 to 21:00 on the day before the experiment. The meal contained 1010 kcal and consisted of 23% protein, 17% fat, and 60% carbohydrate. After the meal, they did not consume anything other than water. Subjects arrived at the swimming pool at 6:30 the next morning and warmed up briefly. The experiments were carried out in a swimming flume (Nomura et al., 1981). During the swimming test, the flow speed was continuously adjusted by an impeller and the uniformity of water flow distribution was maintained by a surface regulator, which allowed us to control the load to the swimmer. The test drinks were 21 g/100 mL CHO solutions containing either glucose or HBCD. By adjusting the volume of the test drinks, the dose given to participants was 1.5 g CHO/kg bw. The volume of the test drinks was around 500 mL, and the control drink consisted of 500 mL of water. Following sample intake, the subjects immediately started swimming in the swimming flume. One cycle consisted of 5 min swimming at 75% and 3 min of rest. After 10 cycles, the subjects swam at 90% until exhaustion. When the subjects were forced to move 1 m back from their starting position, they were regarded as exhausted. The three trials (HBCD, glucose, or control drink) were carried out in random order with at least a 1 week inter-trial interval. During the experiment, the average energy expenditure of subjects administered HBCD, glucose and water was 972.4 ± 44.4 kcal, 901.6 ± 24.1 kcal, 909.4 ± 27.3 kcal, respectively, calculated using VO2max and swimming time. Assays for blood glucose and lactate Blood was drawn from the fingertip prior to the swimming test, after the 2nd, 4th, 6th, 8th, 10th cycles, and after the 90% VO2max swimming. The concentrations of blood glucose and lactate were analyzed using a Biosen1020 analyzer (EKF Industrial Electronics, Barleben, Germany) immediately after blood collection. Statistical analysis All data are presented as the mean ± standard error of the mean (SEM) unless otherwise noted. Data were analyzed by a repeated measures ANOVA, followed by Tukey's post-hoc test, using SPSS software for Windows 21.0 (SPSS Inc, Chicago, IL, USA). p < 0.05 was considered to be significant. All subjects completed the three trials without complaining of any abnormal conditions. The subjects swam at the 90% condition for 504.4 ± 133.3, 283.7 ± 48.2, and 309.4 ± 73.9 seconds in the HBCD, glucose, and control trials, respectively. The time to exhaustion in the HBCD trial was significantly longer (about 70%) than that in the glucose or control trial (Fig. 1). Blood glucose and lactate levels during the trials are shown in Figs. 2 and 3, respectively. After the 4th cycle and the 90% swimming, the blood glucose levels in the HBCD trials were significantly higher than those in the glucose and control trials. During the 75% cycles, the HBCD group exhibited significantly higher blood glucose levels in three of five measurement points compared to the control. On the other hand, the levels in the glucose trial were higher than the control only after the 2nd cycle. In regards to blood lactate levels, there were no significant differences among the 3 trials during the 75% cycles. After 90% swimming, however, the level was significantly higher in the HBCD trial than in the 2 other trials. Subjects' rating of perceived exertion (RPE) after the final swim did not significantly differ at 17.3 ± 0.738, 16.9 ± 0.670, and 16.9 ± 0.565 for the HBCD, glucose, and control trials, respectively. Time to exhaustion in the 90% swimming phase of HBCD, glucose, and control trials. Asterisks indicate significant differences (p < 0.05). Blood glucose levels in the HBCD, glucose, and control trials. Values with different letters are significantly different (p < 0.05). Blood lactate levels in the HBCD, glucose, and control trials. Values with different letters are significantly different (p < 0.05). In this study, the time to exhaustion at 90% for the control trial was about 300 sec, which was consistent with previous studies (Fernandes et al., 2003; Nomura et al., 1981). The ingestion of HBCD resulted in a significant increase in the time to exhaustion. Indeed, the higher lactate level (Fig. 3) after 90% swimming in the HBCD trial suggested that the subjects oxidized greater amounts of CHO to yield energy following HBCD intake, compared to glucose or water intake. It has been demonstrated that blood glucose levels are important during exercise, especially at the final stage of a prolonged exercise routine (Coyle, 1992; Coyle and Coggan, 1984). Indeed, CHO supplementation was demonstrated to maintain blood glucose levels and increase endurance performance times. Therefore, in our study, the differences in time to exhaustion between the HBCD and control trials could be attributed to the relatively high blood glucose level in the HBCD trial. However, the blood glucose levels in the glucose trial were also higher than those in the control trial. Therefore, in this study, the negative effects of glucose ingestion might negate the positive effects of high glucose levels. One possible explanation for this could be the effect of insulin. Insulin is released into the blood stream following a spike in blood glucose levels, and could result in hypoglycemia and inhibition of lipolysis, resulting in decreased exercise performance. In an animal study, HBCD had a lower impact on insulin increase than the same amount of glucose (Takii et al., 1999). We were unable to measure insulin levels in this study because of limitations in the amount of blood collected. Further studies are needed to clarify the effect of HBCD on insulin secretion in humans during exercise. Another important, possibly negative, effect of glucose solution intake, may be on gastric emptying. The replenishment of fluid and nutrients during exercise is mainly limited by gastric emptying, a phenomenon that is affected by several factors. Takii et al. (2005) reported on the relationship between the osmotic pressure of various CHO solutions, including HBCD, and gastric emptying, and found that lower osmolality resulted in faster gastric emptying. Gastric emptying is also affected by the intensity of the exercise routine; when exercise intensity exceeds 75% , gastric emptying is significantly reduced (Costill and Saltin, 1974). Thus, the glucose solution employed in our study might remain in the stomachs of subjects much longer compared to the HBCD solution. This might result in slower water absorption from the intestine and reduced performance. The negative effects of dehydration on endurance exercise performance are well known (Judelson et al., 2007). Also, gastrointestinal disorders such as flatulence, nausea, and abdominal pain could reduce performance. Fatigue during exercise can be determined by various factors including muscle glycogen levels, metabolic disturbance of muscles, and neurological alterations (Coyle, 1992). Glucose intake might directly or indirectly negatively affect these factors compared to HBCD. In summary, HBCD, a type of maltodextrin with a narrow molecular weight distribution, was proposed to enhance endurance performance in elite athletes, likely by maintaining relatively high blood glucose levels without the negative effects of low-molecular weight CHO. Choi, S.S., Danielewska-Nikiel, B., Ohdan, K., Kojima, I., Takata, H., and Kuriki, T. (2009). Safety evaluation of highly-branched cyclic dextrin and a 1,4-alpha-glucan branching enzyme from Bacillus stearothermophilus. Regul. Toxicol. Pharmacol., 55, 281-290. Coombes, J.S. and Hamilton, K.L. (2000). The effectiveness of commercially available sports drinks. Sports Med., 29, 181-209. Costill, D.L. and Saltin, B. (1974). Factors limiting gastric emptying during rest and exercise. J. Appl. Physiol., 37, 679-683. Coyle, E.F. (1992). Carbohydrate supplementation during exercise. J. Nutr., 122, 788-795. Coyle, E.F. and Coggan, A.R. (1984). Effectiveness of carbohydrate feeding in delaying fatigue during prolonged exercise. Sports Med., 1, 446-458. Fernandes, R.J., Cardoso, C.S., Soares, S.M., Ascensao, A., Colaco, P.J., and Vilas-Boas, J.P. (2003). Time limit and VO2 slow component at intensities corresponding to in swimmers. Int. J. Sports Med., 24, 576-581. Furuyashiki, T., Tanimoto, H., Yokoyama, Y., Kitaura, Y., Kuriki, T., and Shimomura, Y. (2014). Effects of ingesting highly branched cyclic dextrin during endurance exercise on rating of perceived exertion and blood components associated with energy metabolism. Biosci. Biotechnol. Biochem., 78, 2117-2119. Ishihara, K., Yamada, A., Mita, Y., Goto, A., Ishimi, T., Mabuchi, H., Inoue, K., Fushiki, T., and Yasumoto, K. (2009). Improved swimming pool achieves higher reproducibility and sensitivity to effect of food components as ergogenic aids. J. Nutr. Sci. Vitaminol., 55, 301-308. Judelson, D.A., Maresh, C.M., Anderson, J.M., Armstrong, L.E., Casa, D.J., Kraemer, W.J., and Volek, J.S. (2007). Hydration and muscular performance: does fluid balance affect strength, power and high-intensity endurance? Sports Med., 37, 907-921. Kerksick, C., Harvey, T., Stout, J., Campbell, B., Wilborn, C., Kreider, R., Kalman, D., Ziegenfuss, T., Lopez, H., Landis, J., Ivy, J.L., and Antonio, J. (2008). International Society of Sports Nutrition position stand: nutrient timing. J. Int. Soc. Sports Nutr., 5, 17. Nomura, T., Kurokawa, T., Ikegami, H., Tomoda, Y., and Tsubakimoto, S. (1981). Maximal oxygen uptake during swimming by using the swimming flume. - Comparison between constant load and progressive method. Health & Sport Science, The Univ. of Tsukuba, 4, 91-96. Takata, H., Ohdan, K., Takaha, T., Kuriki, T., and Okada, S. (2003). Properties of branching enzyme from hyperthermophilic bacterium, Aquifex aeolicus, and its potential for production of highly-branched cyclic dextrin. J. Appl. Glycosci., 50, 15-20. Takata, H., Takaha, T., Okada, S., Hizukuri, S., Takagi, M., and Imanaka, T. (1996). Structure of the cyclic glucan produced from amylopectin by Bacillus stearothermophilus branching enzyme. Carbohydr. Res., 295, 91-101. Takii, H., Ishihara, K., Kometani, T., Okada, S., and Fushiki, T. (1999). Enhancement of swimming endurance in mice by highly branched cyclic dextrin. Biosci. Biotechnol. Biochem., 63, 2045-2052. Takii, H., Kometani, T., Nishimura, T., Kuriki, T., and Fushiki, T. (2004). A sports drink based on highly branched cyclic dextrin generates few gastrointestinal disorders in untrained men during bicycle exercise. Food Sci. Technol. Res., 10, 428-431. Takii, H., Takii Nagao, Y., Kometani, T., Nishimura, T., Nakae, T., Kuriki, T., and Fushiki, T. (2005). Fluids containing a highly branched cyclic dextrin influence the gastric emptying rate. Int. J. Sports Med., 26, 314-319.